Finally, Bryan Colangelo gets his man. 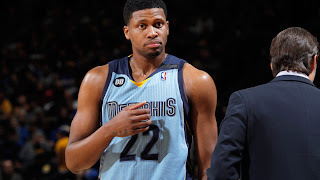 The President of the Toronto Raptors has made no bones about how much he has loved Rudy Gay since back to his days at Connecticut and tonight, he pulled the strings to get his man by pulling off a trade with the Grizzlies with the Pistons also in the mix. Toronto is sending Ed Davis and Jose Calderon to Memphis, who will then flip Calderon to Detroit for Tayshaun Prince and Austin Daye. The immortal Hamed Haddadi will also be sent north of the border as well where he will promptly be cut. So let's break down the trade as I think there is one clear winner, one team that is generally happy and one team that really lost. Memphis made the right move in shipping out Gay and his enormous contract to ensure some financial security going forward, even if it meant breaking up the core of the fourth-place team in the Western Conference. Yes, the Prince contract is not pretty but it pales in comparison to Gay's. The Grizzlies still need shooting, even if Prince and Daye shoot well from deep in the River City, which is reasonable to expect if both are utilized properly. The real coup for them is Davis, who has greatly improved this year and gives the team more depth down low to give breathers to Zach Randolph and Marc Gasol while getting better production than what the team is giving out in Gay, when you look at per-36 minute production (Davis: 14.5 points, 6.8 rebounds, 55 percent shooting; Gay: 16.9 points on five more shots, 5.8 rebounds, 41% shooting). I think the Pistons are really the big winner in acquiring Calderon, who gives the team the distributor they desperately needed as well as a consistent shooter from the perimeter and a near-lock from the charity stripe. In addition, they ship out a pair of guys who did not factor into the team's future while also clearing out some space for their wings and thanks to dumping Prince's contract for Calderon's expiring deal, they can now become a player this free agency. Plus, Calderon helps immensely in the team's run at the playoffs. Without question, Toronto lost big time and I think Colangelo has lost whatever credibility he had. When you look at his game and his numbers, Gay is not as good as you think he is. He shoots too much at a low clip, is borderline average from deep, does not get to the free throw line, doesn't rebound nor does he play much defense. Plus, did I mention his contract? The Raptors are looking to make a playoff push and they pushed their chips to the table and will go to war with a core of Gay, DeMar DeRozan and Andrea Bargnani with a crowded wing with the overpaid Landry Fields and the talented rookie Terrence Ross. Nice. And I hope fans in Toronto like that core because the team is projected to be in the luxury cap next season. Personally, I love it when teams shackle themselves financially for mediocrity.